Hello Beauties! 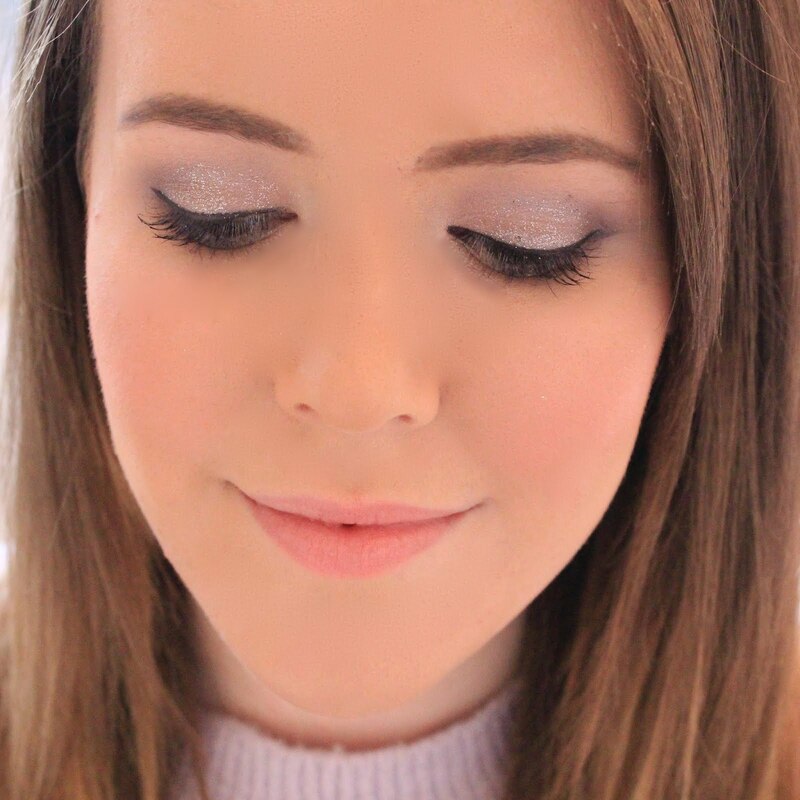 Some of you may have noticed that I've been a little absent over here on Lipgloss & Lashes, as I've been in Vegas for the past week..and the week before that was spend packing and planning, which didn't leave much time for blogging! One of my new year's goals for my blog was to incorporate more travel content as it's something I enjoy so much, so now we're in April and I've actually travelled somewhere, I thought I'd kick things off with a travel diary. For the first day of our trip, my brother was still under 21 - so drinking and gambling was off the cards. Instead, we used our first day to get most of our shopping done, as our jet lag meant we could get to the shops early before they got too busy. I'd been saving up a bit of money over the months leading up to our trip to buy myself a Kate Spade bag from one of the outlets in Vegas, so on our first day that's exactly what I did. We headed out to the South Las Vegas Premuium Outlets to load up on designer goodies at high street prices and I have to say, I was really impressed. The Kate Spade outlet was one of the biggest I've seen and I managed to walk away with a bag, laptop case and keyring for under $300. I also picked up a few dresses from Banana Republic and wondered around some of the other outlets. For lunch, we headed to In-N-Out Burger as I'd heard great things, and it's something we can't get in England. The menu only had three things (I only found out about the secret menu after my visit!) but overall I was impressed, and it was great for grabbing a quick bite to eat. After lunch we headed back to the strip to take a look at some of the hotels. The hotels in Vegas are extraordinary - I could have spend the whole week looking around and watching all of the shows they put on. 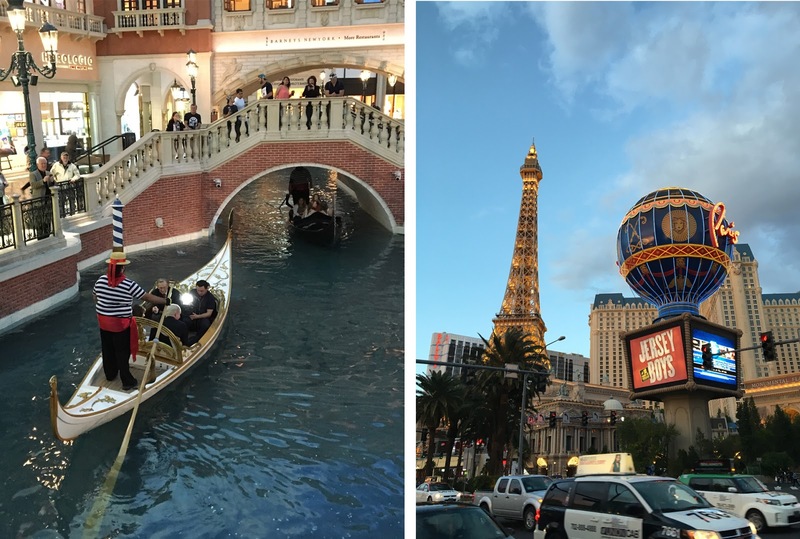 On Day 1 we headed down to one of my favourites, the Venetian. I adore the little gondola river they have running through the shopping mall and think the singing is so cute! The whole hotel was so ornate and every last detail had been thought of - I was so impressed! After the Venetian, we walked over to the Bellagio where they had a huge Japanese Garden, complete with giant birds made completely out of flowers and a waterfall. The whole hotel was so impressive, but not as impressive as the water fountains outside, which dance to the music at certain times throughout the night. While we were there, we saw the fountains dance to 'My Heart Will Go On' which just so happens to be one of my favourites, so I was completely in my element. After watching the fountains we headed to 'Paris' for dinner. I adored Paris, purely for the mini Eiffel Tower and Arc De Triomph outside, and the fact that the inside of the hotel was so french. We actually had dinner in Martorano's which is an Italian restaurant - but despite it not being a french restaurant, the food was incredible and the carbonara I had was one of the best I've ever tasted. Day 2 was actually my brother's birthday, so in the morning we headed down to the shooting range to go machine gun shooting. It doesn’t seem like the most birthday-like activity, but we went shooting for my birthday and all loved it, so we thought we’d give it another go with some different guns. At the shooting range we were all given a lesson in how to shoot each type of gun, as the kick-back was going to be a lot stronger than we were used to. We each got to shoot three different types of machine gun and a hand gun, and the whole thing was incredibly fun and the staff at the range were so friendly and good to us – I’d definitely recommend it to anyone planning a trip. That night for dinner, we headed down to the Capital Grille which was so lovely and luxurious, and again, the staff were brilliant. We indulged on cocktails and steak to celebrate my brother’s birthday, and afterwards we headed down the stip to watch the Volcano which goes off every night outside the Mirage (there’s a video of this on my Instagram). Although my Dad told me the volcano wasn’t that impressive, I really loved it and it’s definitely worth seeing while you’re in Vegas. After watching the volcano, we headed down to Caesars palace for a little look round and a bit of gambling. Whilst my brother sat at the blackjack table, both myself and my Mum tried our luck at the slot machines. 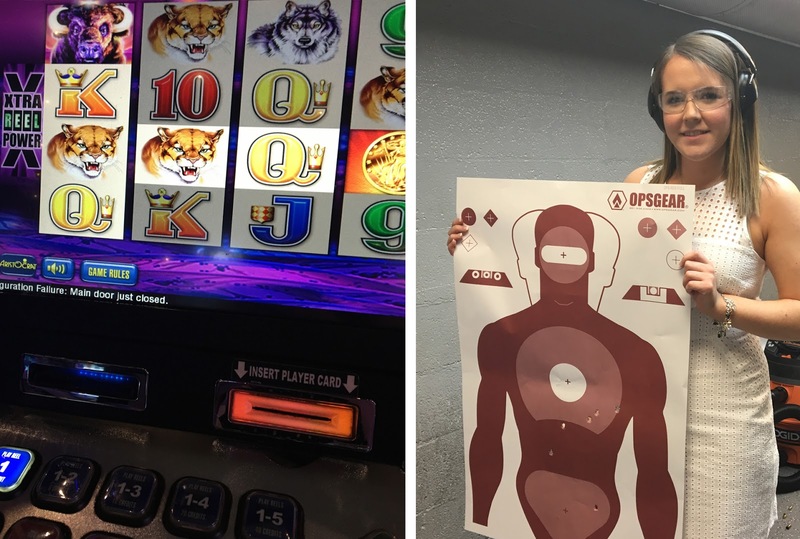 I wouldn’t say we won big, but considering we were only playing the 25cent and $1 machines, we did well to come away with a profit…which went straight into my Sephora fund! 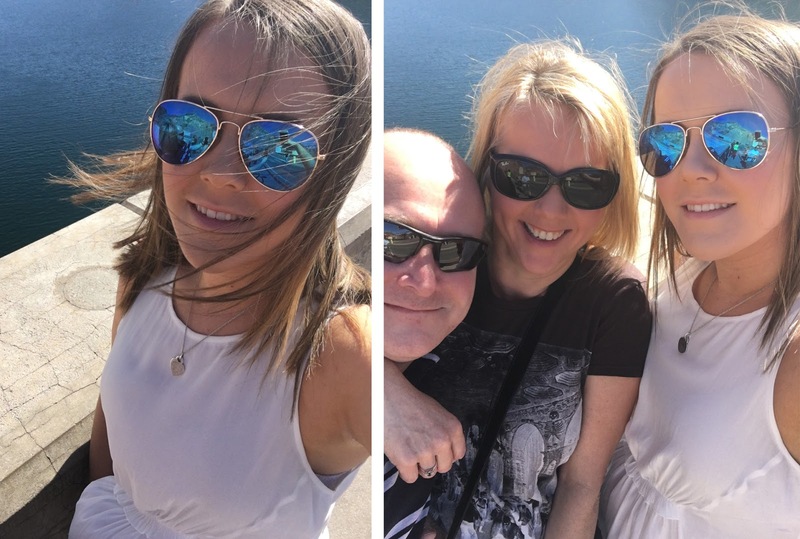 On day 3 we decided to take a road trip out of town to visit the Hoover Dam and the Grand Canyon. The Hoover Dam was about an hour away from our apartment and was on the way to the Grand Canyon, so it seemed silly to just drive straight past. Although there’s not a lot to see (it is a dam afterall), it was still cool to stand on the Nevada/Arizona state line and take a little look around. The drive to the Grand Canyon took hours, but the view was definitely worth it in the end. We ended up driving a little further up than the helicopter tours take you, as the canyon really opens up a little further up and the view is so much better. If you’re ever in Vegas I’d definitely recommend heading down to the Grand Canyon – it’s a view I’ll never forget and seeing the whole canyon in front of me for the first time was such a special moment. On Day 4, we spent the day looking around the hotels we hadn’t had a chance to see yet. We started right at the end of the strip at the Luxor and Excalubur hotels. Out of all the hotels, I have to say, these weren’t my favourite. 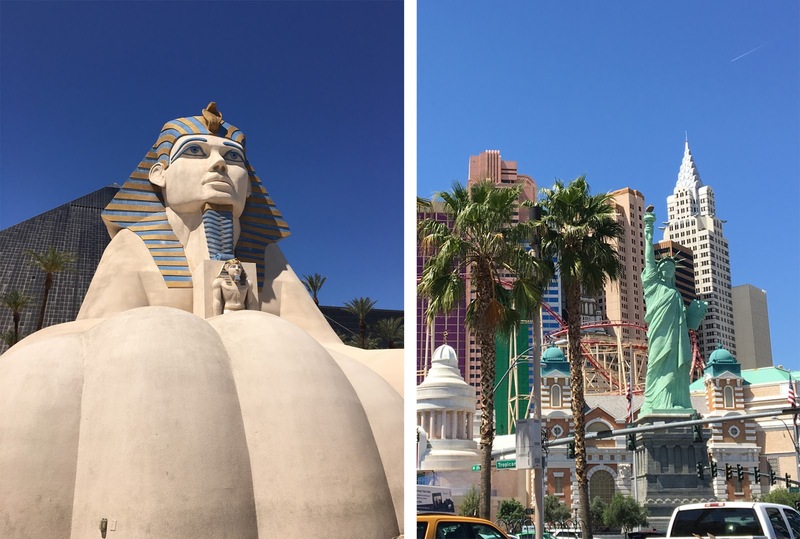 Both looked a little tired, but they were still worth seeing – even if it’s just to see the giant sphinx outside. After this we headed over to New York, New York which was another one of my favourites. The hotel is laid out as a collection of iconic New York buildings, a mini Statue of Liberty and the Big Apple roller coaster. The inside of the hotel is filled with tonnes of new york style restaurants and looks like you’re walking around a film set – which I thought was so cool! Before thinking about food though, both myself and my Mum took a ride on the Big Apple coasters, which is definitely an experience I’d never forget! Having only driven past it briefly, I wasn’t quite aware of just how big the roller coaster was, but despite it giving me a mini heart attack, it was brilliant fun and the views at the top were spectacular. That night, we headed to the Aria for dinner, which is a superb hotel. Everything about it is so upmarket and luxurious, and it’s definitely one I’d like to stay in. Before settling down for some food we headed to the cocktail bar where we indulged on some cocktails to start the night off. After dinner we headed to the Bellagio as I was desperate for a go on the ‘Deal or No Deal’ game – I’m such a loser! But I did end up winning about $60 in total which wasn’t bad for the $2 I spent! Day 5 was our last day (we flew out at 8pm that night) so we started by heading down to the gift shop. I was despaerate for some tacky Vegas things to bring back, being the tourist that I am and I wasn’t left disappointed! After this we headed to the mall to spend our winnings and I spent an obscene amount of money in Sephora – haul coming soon! 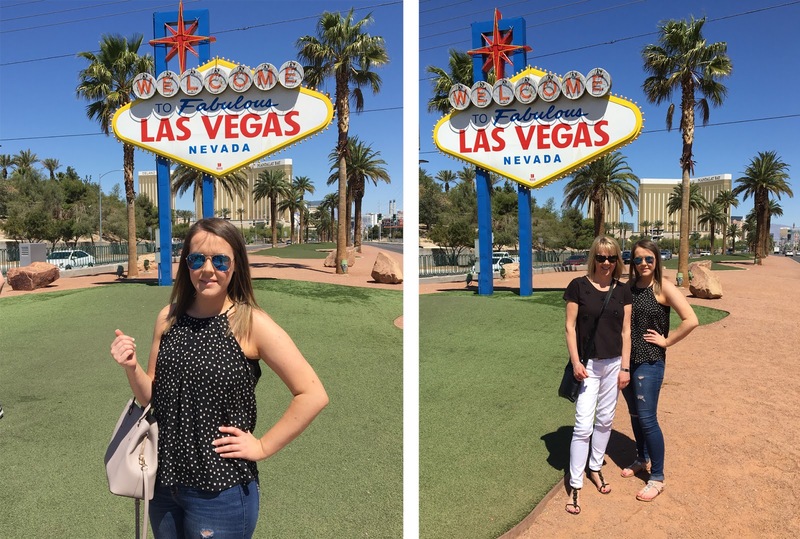 And we could hardly leave Vegas without a picture infront of the famous ‘Welcome to Fabulous Las Vegas’ sign, so we stopped off there for a few snaps before heading down to Old Las Vegas, which was where it all originally started. We had a quick wiz around the Golden Nugget which features in a couple of Bond films and walked up and down Fremont street before sadly heading to the airport! Phew, that was a long post! Seriously, well done if you’ve got down this far – I completely didn’t mean for this post to be quite so long, but I wanted to document my whole trip and include some of my favourite photos! i saw your journey on instagram and oh my, it looked amazing"
Vegas is on my list of places to visit one day. The views look amazing. Heavenly! Need to go here, thanks for sharing, so many lovely images. Wish I could pay a visit to LA one day. Love your sunglasses! I love Vegas, it's one of my favourite places to visit. We're going again for my mum's birthday in October and staying at The Venetian this year. I can't wait. Your trip looked such fun, I'm really keen to try the shooting out there!